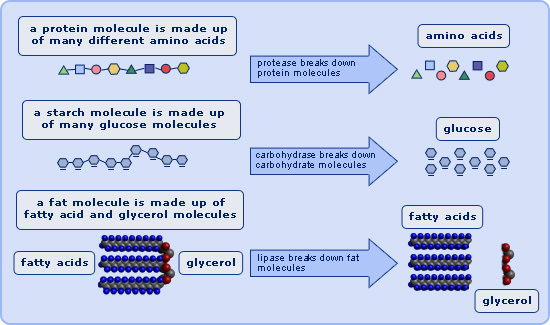 As we know enzymes are important molecules, they are particularly important in digestion as they help break down large, insoluble food molecules into small, soluble molecules which can be easily absorbed. Enzymes work best at their optimum pH. So for example if the stomach does not produce enough HCl, the enzyme, pepsin, will not work properly, (remember the optimum pH for pepsin is 2). There are 3 main types of enzymes in our gut: Protease, Carbohydrase, and Lipase. NOTE: It’s important you recall the main digestive enzymes, the food types they break down and where they are produced.